GO plc (GO) delivered a strong set of results for the year ended 31st December 2013, with revenues of €122 million, profit from core trading operations amounting to €18.0 million and net cash from operations of almost €40 million. This was announced by GO chairman Deepak Padmanabhan at the company’s annual general meeting held on 6 May 2014. In his address, Mr Padmanabhan explained that in spite of extensive competition and regulatory pressures negatively impacting operations, GO delivered impressive financial results thanks to the confidence that customers continue to place in GO’s products and services and its dedicated and committed employees. Mr Padmanabhan outlined the Group’s proactive strategy of investing in people, infrastructure, services, content and technology in order to meet and exceed customer expectations thus enabling GO to maintain its leading market position across telephony, mobile, Internet, and TV services. “Our present and future success depends on our ability to assess accurately both our industry and the wider economic realities in order to be able to make the right investment decisions for our business,” said Mr Padmanabhan. 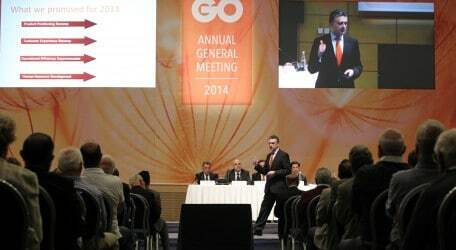 GO’s CEO Yiannos Michaelides presented shareholders with a detailed review of the market context in which GO operates, the most significant developments and achievements of 2013, and the strategy for future development of the business. GO’s CFO Edmond Brincat briefed shareholders on the Group’s financial performance and provided an update on GO’s investment in the Greece-based operator Forthnet through Forgendo, including GO’s participation in the capital increase concluded earlier this year. Mr. Brincat also briefed shareholders on the rationale and evaluation which lead to GO investing in Cyprus-based cable operator Cablenet. “GO will remain focussed on continuously improving every aspect of the business, its operations, and interactions with customers who have made us the leading provider of telecommunications services in Malta. We are ready more than ever to take on challenges while seizing new opportunities,” asserted Mr Padmanabhan. The presentations were followed by a question and answer session during which shareholders put forward queries and suggestions to GO’s senior management team. The AGM elected the board of directors for the next financial year, approved various resolutions which included the approval of the financial results for the year ended 31st December 2013 and the payment of a net dividend of €0.07 per share (net of taxation).